the first utility-scale solar PV plant in Jamaica. Monday, April 9, 2018 — In 2017, catastrophic weather events, including Hurricanes Irma and Maria, devastated electric systems throughout the U.S., Puerto Rico, and the Caribbean. In Jamaica, unprecedented torrential rainfall, massive flooding, and landslides battered Jamaica’ s Montego Bay area, severely impacting 10 of the country’s 14 parishes, with Clarendon being the most affected. Clarendon is the home to Content Solar, Jamaica’s first utility-scale solar photovoltaic (PV) plant. Developed by renewable energy veteran WRB Energy, Content Solar in Clarendon was unaffected by the severe weather conditions that inundated the greater May Pen area with 17 feet of flood water and severely damaged bridges, roads and communities over a four-day period in May 2017. According to Robert Blenker, President and CEO of WRB Energy, the resiliency of Content Solar is attributed to its proper design, thoughtful siting, good construction and high-quality equipment. “Content Solar was designed in compliance with internationally recognized standards that meet and exceed Jamaica’s standards for electrical, structural and environmental requirements,” states Mr. Blenker. In the Caribbean, renewable energy projects, including the solar panels and inverter equipment, are subject to severe stress from heavy rains, hurricane-force winds, and devastating flooding. That’s why the 28-megawatt, utility-scale Content Solar PV installation in Jamaica was developed and designed to withstand intense tropical storms and severe hurricane weather conditions. With hurricane-force wind speed of over 74 miles per hour (mph), torrential rain, and flooding, solar panels risk being dislodged, damaged and devastated by high volumes of wind and water. As a safeguard, WRB Energy’s pre-construction checklist includes flood mapping and wind surveys. In addition, Content Solar’s panels were tested to help ensure greater resiliency in case of severe storms and hurricanes. The racking used on Content Solar is specially designed with screw piles constructed to withstand hurricane-force winds. 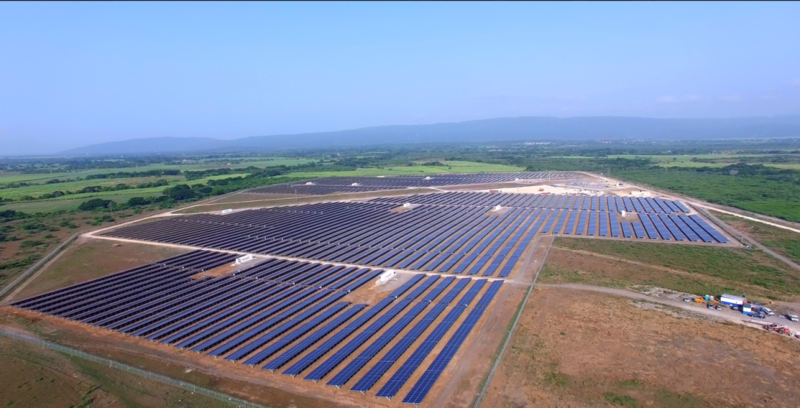 Content Solar, one of the largest solar PV renewable energy projects in the Caribbean, was commissioned for commercial operation in August 2016. The project is the culmination of three years of work to ensure that the 154-acre solar facility is well designed, well placed, and compatible with Jamaica and designed to withstand its weather conditions. Content Solar is part of Jamaica’s goal of 30 percent of its national energy production from renewable sources by 2030, and long-term vision for greater energy independence and economic development. Over the next twenty years, Content Solar will power more than 20,000 households and businesses annually under a power purchase agreement with the Jamaica Public Service Company. Developed by WRB Energy, a U.S.-based company located in Tampa, Florida, the project represents an investment of over US$60 million financed by WRB SERRA and the Overseas Private Investment Corporation (OPIC). The WRB team has decades of experience in utility ownership, operations, and renewable energy development in the Caribbean and Latin America, dating back to the early 80s. The Content Solar project is part of WRB’s mission to increase renewable energy production cost-effectively and help stabilize electricity costs for sustainable economic growth in the communities it serves. WRB Energy provides renewable energy solutions to help stabilize electricity prices and reduce dependence on imported fuels to drive economic growth and sustainability in Latin America and the Caribbean. WRB Energy manages the entire project lifecycle including project selection, design, permitting, financing, construction and operation. Additional information is available at https://wrbenergy.com/.